Stomp on This Classic Pedal for Vintage Fuzzed-Out Tone! 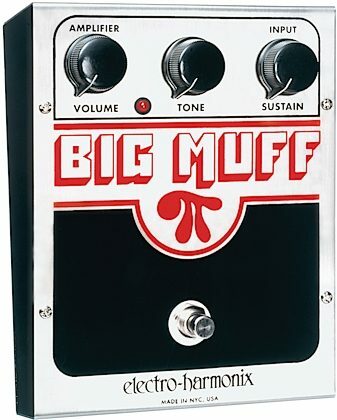 Few stompboxes can tap into a legacy as rich as the classic Big Muff from Electro-Harmonix. From Hendrix and Santana to the titans of '90s grunge, the venerable Big Muff has inspired players and defined genres for the better part of 30 years. Still built in New York by the craftsmen at Electro-Harmonix, the newest Big Muffs deliver all the fuzzy goodness of its forebears with volume, tone, and sustain knobs to help you dial in that perfect fuzz setting. All housed in a rugged chassis, the Electro-Harmonix Big Muff Pi is an essential part of any pedal board. zZounds is an authorized dealer of Electro-Harmonix products. Like the legendary Big Muff Pi of the '70s, the reissue has 3 controls that let the player dial in the finest harmonic distortion/sustain ever produced. The Volume control adjusts the output level. The Big Muff's Sustain control optimizes the long sustain with just the right amount of harmonic distortion. The Tone control provides a range of sounds, from warm bass to crisp treble. This Big Muff Pi is a made in NYC original. "Fizzy Fuzz From The Fuzz Godz"
Sound: This is the fuzz for psychedelic stuff. Feature: Very basic controls... the way it should be. Wish it wasn't so hard to track down an AC adapter for this thing. Quality: Good quality Value: Affordable. Manufacturer Support: Actually, I never talked to these dudes but they've been around a while. The Wow Factor: Still the coolest looking fuzz pedal. Overall: I will keep this fuzz till death. I had one of these in the 70's(who knows what happened to it). I finally got another recently and man I missed this sound. Sound: It sounds great and you can adjust how clean or how distorted it is. You can also adjust how much treble or how much bass you want in the sound. Feature: It comes with a battery, but if you own a pedalboard, the cables that come with it won't work so you'll just have to keep replacing the battery. Ease of Use: There's only three knobs so it's pretty easy to use. Quality: It's really large but the sound is great and it's real durable. Value: It's a nice sounding pedal and not THAT much money. Manufacturer Support: I just got it so I don't really know anything about the support from the company. The Wow Factor: No other pedal sounds like this so it's pretty appealing. Overall: It is a great pedal and it definitely deserves a 10 overall because it's a unique pedal. 9 of 10 people (90%) found this review helpful. Did you?